The design, development and operational use of the battleships used by the Kriegsmarine. Chinese, Japanese, and Western scholars are brought together to provide a comprehensive overview of the military operations of the Second Sino-Japanese War. Greece: The Second Hellenic Republic is proclaimed. This is the second period in modern Greek history where Greece is not headed by a king. CBI - China: Day 84 of 142 of the 1st Battle of Hebei. Spain: Day 252 of 985 of the Spanish Civil War. France: The Evian Conference is held to discuss the arrangement of homes for Jewish refugees fleeing Germany. Ultimately nothing is gained by this conference. Germany: Adolf Hitler gives a speech at Königsberg to express his approval of the annexation of Austria. Spain: Day 617 of 985 of the Spanish Civil War. CBI - China: Day 262 of 2,987 of the 2nd Sino-Japanese War. Day 47 of 124 of the Battle of Henan. Day 2 of 15 of the Battle of Taierzhuang. Japanese artillery begins bombarding the city walls. Chinese troops accidentally stumble upon the Japanese artillery positions and scatter the gun crews. Day 2 of 39 of the Battle of Xuzhou. Germany: German intelligence informs Hitler that Polish troop movements on the Polish border with Danzig have been detected. Hitler tells his Army Chief to use this so they can acquire Danzig too. Eastern Front: Day 3 of 13 of the Slovak-Hungarian War, aka the Little War. The Hungarian Air Force bombs the Slovakian airfield at Spisská Nová Ves. Spain: Day 982 of 985 of the Spanish Civil War. CBI - China: Day 627 of 2,987 of the 2nd Sino-Japanese War. Day 9 of 54 of the Battle of Nanchang. USA: The US gives contractors to the US Army Air Corps the authority to sell to the anti-Axis governments the most modern types of combat aircraft America has. Atlantic: German sub U-57 sinks the British tanker DAGHESTAN and the Danish steamer BRITTA off the coast of Scotland. UK: The British government forbids captured servicemen to participate in enemy propaganda radio broadcasts. ETO - UK: French PM Reynaud writes to the British War Cabinet, wishing to undermine further Soviet expansion into Scandinavia. British PM Chamberlain refuses, not wanting any hostility with the USSR. ETO - Norway: Swiss intelligence tells Norway they have evidence of a German invasion, but Norway decides to ignore this warning. Hungary: Prime Minister Pál Teleki meets with Italian Foreign Minister Galeazzo Ciano. Teleki voices neutrality for Hungary. CBI - China: Day 993 of 2,987 of the 2nd Sino-Japanese War. Day 132 of 381 of the Battle of South Guangxi. Day 58 of 67 of the Battle of Wuyuan. Atlantic: German cruiser THOR sinks the British liner BRITANNIA 750 miles west of Freetown, Sierra Leone, only one survivor. Later, THOR sinks the Swedish merchant ship TROLLEHOLM. Atlantic: German cruiser KORMORAN captures the Canadian tanker CANADOLITE in the Mid-Atlantic about halfway between British West Africa and Brazil. UK: Jams and marmalade rationing in Britain is reduced to 8 ounces per person per month and meat rationing is cut to 6 ounces per person per week. ETO - UK: Day 201 of 258 of the Blitz. MTO - Yugoslavia: Under heavy pressure, Yugoslavia secretly signs the Tripartite Pact. When word leaks out, anti-Axis demonstrations breakout in Belgrade. MTO - Greece: Italian destroyers CRISPI and SELLA depart from Leros, Dodecanese Islands. That night they attack British ships at Suda Bay, Crete, using six motor boats packed with TNT. East Africa: Day 289 of 537 of Italy's East African campaign in the lands south of Egypt. East Africa - Eritrea: Day 49 of 56 of the Battle of Keren. British and Indian troops capture two small hills above the Dongolaas Gorge, gaining control of the road below. CBI - China: Day 1,358 of 2,987 of the 2nd Sino-Japanese War. Day 12 of 27 of the Battle of Shanggao. CBI - Thailand: Day 176 of 221 of the Franco-Thai War (Vichy France vs Thailand). USA: The CEO of Standard Oil of New Jersey pleads "no contest" to charges of criminal conspiracy with the Nazis for not sharing their patents for making synthetic rubber with other American rubber companies. This stems from a 1927 partnership and research agreement between Standard Oil and German company I G Farben. February 1942: Synthetic rubber (Ameripol) worker standing on blowdown at the Akron, Ohio, synthetic rubber plant of the B F Goodrich Company. Without rubber and oil, the ability of any of the major combatants to wage war simply could not be sustained. 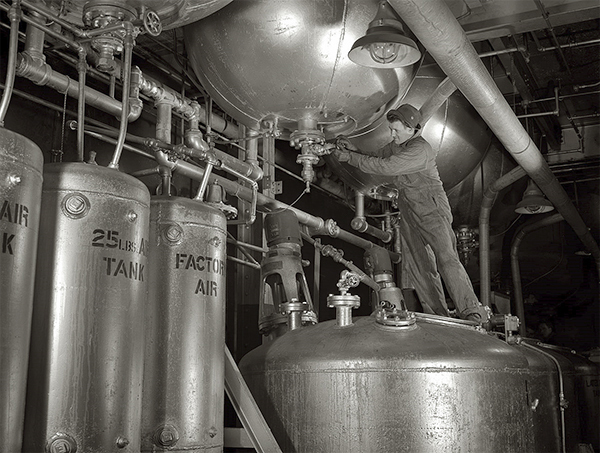 With natural sources curtailed or cut off, the development of technologies for producing synthetic rubber and oil was critical for both Allied and Axis powers alike. Prior to the war, the Standard Oil group of US companies had given critical assistance that helped Nazi Germany prepare for war through partnership and research agreements with German company I G Farben, beginning in 1927. Atlantic: Day 71 of 169 of Germany's Second "Happy Time," during which U-boats sink 609 Allied ships with little risk. U-552 sinks the Dutch tanker OCANA southwest of Halifax, Nova Scotia, Canada. ETO: Flying a Spitfire, US Major Cecil P Lessig becomes the first USAAF pilot to fly a mission over occupied France in World War II. Russian Front - North: Day 199 of 872 of the Siege of Leningrad. Russian Front - North: Day 46 of 102 of the Battle of the Demyansk Pocket, another failed attempt to break the siege at Leningrad. Russian Front - North: Day 62 of 103 of the Battle of the Kholm Pocket. Another attempt to break the siege at Leningrad. Russian Front - Center: Day 77 of 103 of the Battle of Vyazma, Russia. Russian Front - Center: Day 77 of 103 of the Battle of Sychevsk, Russia. Russian Front - Center: Day 23 of 49 of the Battle of Rzhev, Russia, a diversion to pull more German troops away from Moscow. Russian Front - South: Day 147 of 248 of the Siege of Sevastopol, Crimean Peninsula. CBI - Burma: Day 102 of 164 of Japan's Invasion of Burma. Surrounded on three sides, the Chinese troops manage to hang onto the city of Toungoo. CBI - China: Day 1,723 of 2,987 of the 2nd Sino-Japanese War. Day 92 of 99 of the 3rd Battle of Changsha. PTO: US troops occupy the Society Islands, French Polynesia. PTO - Borneo: Day 100 of 107 of the Battle of Borneo. PTO - Malaya: Day 35 of 357 of the Battle of Timor Island. PTO - Philippines: Day 108 of 152 of the 1st Battle of the Philippines. 5th Air Force provides air support. Japanese Navy planes continue bombing Corregidor. ETO: The Spanish foreign ministry announces they are closing their border with France and will refuse entry to anyone (refugees) without proper transit papers. Russian Front: Russian fighter Ace Lt Grigori Rechkalov receives his first Hero of the Soviet Union award. Later he will earn another one. Russian Front - North: Day 564 of 872 of the Siege of Leningrad. Russian Front - North: Day 44 of 51 of the USSR's Operation POLAR STAR, a failed offensive north of Leningrad, hoping to take the southern shore of Lake Ladoga, Russia. Russian Front - North: Day 325 of 658 of the Siege of the Kholm Pocket, USSR lays siege to the Kholm Pocket but the Germans hold out for a about a year and a half. Russian Front - Center: Day 24 of 30 of the 3rd Battle of Rzhev-Sychevka, Russia. MTO - Greece: Greek partisans temporarily capture Samos Island from an Italian garrison. MTO - Tunisia: Day 129 of 178 of the Battle of Tunisia. RAF and US Air Forces provide Allied air support. Day 10 of 12 of the UK's Operation PUGILIST. The Indian 4th Division overruns the Axis at the Mareth Line. Day 3 of 16 of the Battle of El Guettar. CBI - Burma: Day 95 of 104 of the 1st Battle of Arakan. US 10th Air Force provides air support. Two columns of British Chindits meet up at Shaukpin Chaung river bed. CBI - Burma: Day 46 of 79 of the Allied Operation LONGCLOTH. CBI - China: Day 2,088 of 2,987 of the 2nd Sino-Japanese War. PTO - Alaska: Day 292 of 435 of the Battle of Kiska, Aleutian Islands. US 11th Air Force attacks Kiska hitting the beach, runway, hangar area, North Head, the Main Camp and a submarine base. PTO - Solomon Islands: The Japanese offensive at Bougainville comes to a halt. ETO - UK: Churchill's recommendation to bomb German V-weapon sites is turned down by Eisenhower, who places priority on transportation and communications hubs. ETO - France: US 9th Air Force B-26s attack the marshalling yard at Hirson. Germany: 184 Jews who had recently been arrested from their hiding places in the Hague in the Netherlands arrive at Auschwitz Concentration Camp. Russian Front - North: Day 53 of 191 of the Battle of the Narva Isthmus, Estonia. Both German and Soviet troops in the Baltic region remain in a defensive position. Russian Front - South: Day 93 of 113 of the USSR's Dnieper-Carpathian Offensive in southwestern Ukraine. Russian Front - South: Day 22 of 45 of the Battle of Chernovtsy, Ukraine. Russian Front - South: Day 1 of 15 of the Battle of Kamenets-Podolsky Pocket, Ukraine. The besieged German Army begins a breakout attempt west of Lvov, Ukraine. Russian Front - South: Day 20 of 44 of the Battle of Snigirevka, Ukraine. Hungary: The Hungarian Council of Ministers approves several anti-Semitic policies, including a law requiring all Jews to wear the yellow Star of David. MTO - Italy: Day 69 of 123 of the Battle of Monte Cassino. Bad weather keeps both sides fairly idle. MTO - Italy: Day 64 of 136 of the Battle of Anzio. Bad weather keeps both sides fairly idle. CBI: Japanese planes hit the Allied airstrips at Chittagong and Cox's Bazaar in India, and one at Anisakan, Burma. CBI - Burma: Day 87 of 99 of the 2nd Battle of Arakan. CBI - Burma: Day 21 of 166 of the UK's Operation THURSDAY. CBI - Burma: Day 16 of 147 of the Battle of Myitkyina. US 10th Air Force provides air support. CBI - China: Day 2,454 of 2,987 of the 2nd Sino-Japanese War. US 14th Air Force attacks targets in China. CBI - India: Day 18 of 118 of the Battle of Imphal-Kohima. Day 6 of 7 of the Battle of Sangshak. The reinforced Japanese troops mount another major attack. PTO - Alaska: US 11th Air Force B-24s bomb Kurabu Cape and the north coast of Onnekotan Island. PTO - Japan: The USS POLLACK sinks Japanese Submarine Chaser No 54 and damages two freighters in the Nanpo Islands area. PTO - Marshall Islands: US 7th Air Force attack targets in the Marshalls. PTO - New Guinea: Day 26 of 80 of the Battle of the Admiralty Islands. 5th Air Force provides air support. The US declares Manus Island secure. PTO - New Guinea: Day 189 of 219 of the Battle of Shaggy Ridge. 5th Air Force provides air support. PTO - New Guinea: Day 102 of 597 of the Battle of New Britain. US 13th Air Force provides air support. PTO - Solomon Islands: Day 146 of 295 of the Battle of the Bougainville Islands. US 13th Air Force provides air support. ETO - UK: A German V-2 rocket hits Whitfield Street in St Pancras, London. In the evening another rocket hits Broadfield Square in Enfield, London. ETO - France: Day 238 of 284 of the Battle of Brittany. ETO - France: Day 192 of 236 of the Siege of Dunkirk. ETO: Day 66 of 66 of the Battle to the Rhine. Day 20 of 20 of the Battle of Ramagen. US 1st Army breaks out of the Remagen bridgehead area. ETO - Germany: Day 19 of 46 of the Battle of the Ruhr Pocket. The British 2nd Army captures Wesel which has been nearly 100% destroyed by Allied bombing. Montgomery issues a non-fraternization order as his troops enter into Germany. ETO - Germany: Day 34 of 36 consecutive RAF night raids on Berlin. ETO - Germany: US 8th Air Force bombs oil plants and a tank factory in Germany. Russian Front - Finland: Day 192 of 223 of the Lapland War. Finland and Russia have joined forces to kick the Germans out of Finland's most northern province. Russian Front - Center: Day 162 of 206 of the Battle of the Courland Pocket in Latvia. Russian Front - Center: Day 60 of 75 of the Battle of Königsberg, East Prussia (now Kaliningrad, Russia). Russian Front - Center: Day 59 of 63 of the Battle of the Heiligenbeil Pocket in East Prussia. Russian Front - Center: Day 44 of 54 of the Battle of East Pomerania, Germany. Russian Front - Center: Day 41 of 83 of the German Siege of Breslau (today Wroclaw, Poland). Russian Front - Center: Day 11 of 17 of the USSR's Upper Silesian Offensive in Germany (today Poland). Russian Front - South: Day 13 of 34 of the Battle of Vienna, Austria. MTO: US 15th Air Force bombs targets in Czechoslovakia, Austria and Italy. CBI - Burma: Day 50 of 99 of the Battle of Pakokku and Irrawaddy River operations in central Burma. The US 10th Air Force provides air support. CBI - China: Day 2,819 of 2,987 of the 2nd Sino-Japanese War. PTO: US submarine USS TIRANTE sinks the Japanese tanker FUJI MARU. PTO - Japan: The US Navy begins its pre-invasion bombardment of Okinawa, firing more than half a million shells and rockets in a week. PTO - Japan: US 7th Air Force attacks targets on Chichi Jima Island in the Bonin Islands. PTO - Japan: Day 35 of 36 of the Battle of Iwo Jima in the Bonin Islands. US 7th Air Force provides air support. The US Marines clear the final resistance pocket and are now searching for any remaining holdouts. PTO - New Guinea: Day 454 of 597 of the Battle of New Britain. US 10th Air Force provides air support. PTO - New Guinea: Day 338 of 481 of the Battle of Western New Guinea. US 10th Air Force provides air support. PTO - Philippines: Day 157 of 299 of the 2nd Battle of the Philippines, aka the Liberation of the Philippines or the Philippines Campaign. PTO - Philippines: Day 101 of 244 of the Battle of Luzon. 5th Air Force provides air support. PTO - Philippines: Day 16 of 159 of the Battle of Mindanao Island. 5th Air Force provides air support. PTO - Philippines: Day 8 of 135 of the Battle of the Visayas region. 5th Air Force provides air support. Although it came too late, Nazi Germany's scientists did unlock the secrets to developing all the synthetic oil they needed to wage war. Yet their confiscated documents remained largely ignored in the US. Three competing jet programs took place in Britain, Germany, and the US during the war, each with its own challenges of wartime limitations, government interest and strategic need. The story of some of the groups and individuals that opposed Hitler and his government and the story of their heroic efforts to rid themselves of the most evil regime in modern times.